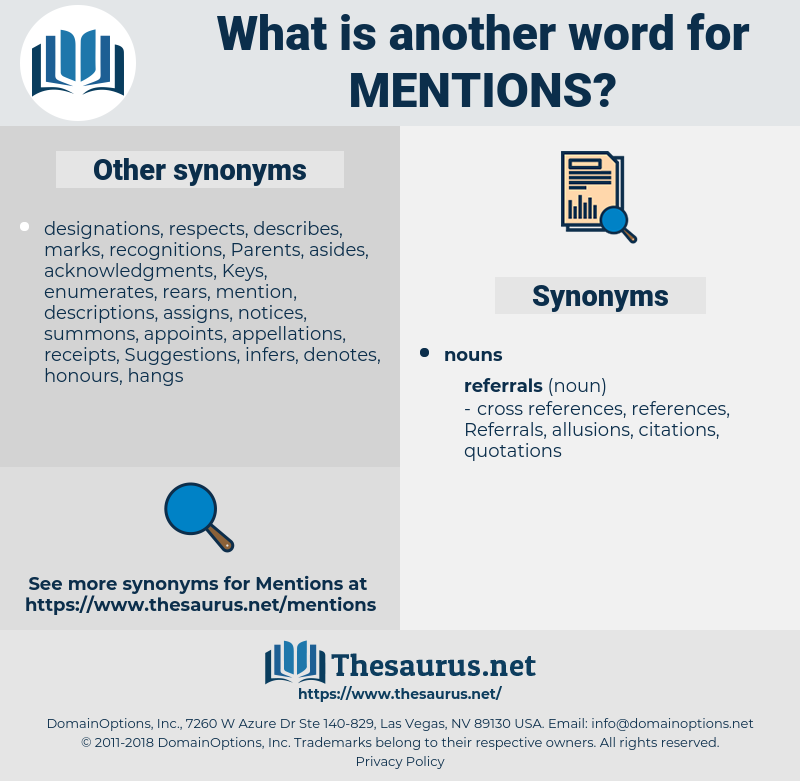 What is another word for mentions? quotations, quotes, statements, Records, phrases, citations. indications, descriptions, names, distinctions, appellations, designation, designations, inscription, inscriptions, quotations, commendations, instructions, quotes, details, observations, endorsements, terms, petitions, annotations, locations, expressions, items, photovoltaics, words, reports, statements, lists, touches, Records, occurrences, listings, sightings, wordings, honors, warnings, summons, Summonses, certificates, hits, letters, subpoenas, states, claims, passages, writs, grades, texts, particulars, phrases, endorsement. 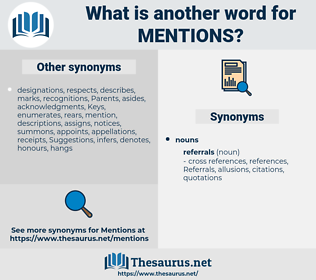 indicates, cites, incorporates, envisions, points, acknowledges, demonstrates, suggests, outlines, notes, initiation, exists, contemplates, question, commemorates, reminds, explains, illustrates, informs, pinpoints, communicates, includes, invokes, reiterates, enumerates, connotes, recognises, commends, identifies, tells, discloses, writes, highlights, involves, emphasises, cautions, confirms, denotes, stipulates, recognizes, emphasizes, designates, contains, determines, remarks, chronicles, hints, documents, encompasses, directs, notifies, announcement, implies, appreciates, introduces, pertains, anticipates, summarizes, contends, reaffirms, symbolizes, moves, considers, examines, elaborates, delineates, depicts, attests, Addresses, underscores, describes, quotes, announces, articulates, consists, specifies, accentuates, presents, traces, asserts, concludes, alleges, reveals, represents, endorses, insists, advocates, concerns, remembers, triggers, celebrates, comprises, summarises, conveys, signifies, belongs, submits, underlines, stresses, says, recounts, speaks, reflects, undermines, proposes, appears, entails, responses, embodies, enshrines, portrays, exhibits, relates, supports, declares, observes, Comes, advises, clarified, clarifies, Recalls, foresees, affirms, exposes, enters, means, explores, assumes, calculates, becomes, intends, discusses, disposes, tackles, argues, uses, covers, realises, Deems, instructs, signals, counters, rule, resembles, warns, possesses, poses, proves, predicts, provides, Gives, establishes, defines, evokes, forecasts, Affects, treats, regards, Focuses, sustains, follows, attaches, expresses, dictates, envisages, response, features, talks, lifts, answers, thinks, aims, adds, finds, reports, raises, maintains, handles, pleads, alerts, captures, conjures, arises, holds, Replies, alludes, sends, shows, relies, reads, sees, prescribes, brings, displays, Faces, yields, looks, reviews, marks, sets, sounds, expects, lists, stands, sums, touches, goes, upholds, requires, status, lays, Records, hears, asks, wishes, calls, Tracks, enunciates, shares, leads, applies, puts, Rests, underpins, draws, Carries, realizes, Om, deals, takes, falls, begs, seeks, Backs, decides, Does, states, claims, tries, makes, particulars. Look who mentions being a bore. It is characteristic that in the Education he barely mentions the History of the United States. menhaden, moth-eaten, madonna, montana, mid-may, medina, montanan, manhattan, maiden, madman, medan, mid-on, monition, Mount Whitney, mahatma, Mindanao, meatman, meantime, modem, madden, muhammadan, mud hen, mitten, midden, methadone, muhammedan, menadione, mentum, methenamine, medium, manawydan, Mutawa'een, Mount Etna, mutton, mithan, mutiny, monodon, Mt Etna, monotone, mundane, Maundy Money, munition, madwoman, mutation, maintain, manawyddan, metonymy, madame, Mandean, momentum, muton, maianthemum, mountain, mantinea, maintenon, methionine, matman, methadon, minuteman, myotonia, mountain anemone, motown, mentation, motion, median, madam, mouton, minden, man-to-man, mow down, muadhdhin, mountain man, meditation, mean time, montane, metonym, myotomy, methane, myodynia, mdma, maiden name, mediation, Mandaean, monotony, matinee, mantineia, mohammedan.